Sometimes the world spins even smaller than one might think. At the second BlogHer Conference in 2006 I invited myself to share the breakfast table of two women I greatly admire - Amy Grahan - Contentious and Dina Mehta - Conversations With Dina. Amy and I have crossed non digital paths but I lost track of Dina until my friend Rajesh Lalwani, BlogWorks, invited me to participate in a conversation about social media . To my delight the third member to join our chat was - you guessed it Dina Mehta! 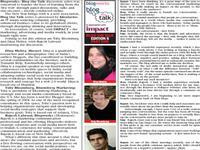 Blog The Talk is a joint project sponsored by Impact, a highly respected Indian biz publication, Idea Farms and BlogWorks. Wonderful idea conceived by Rajesh that brings issues and learnings about social media marketing to the India business community. These are important conversations for anyone interested in the global impact of conversational marketing. Rajesh is not only providing insights and addressing concerns but in retrospect the series will serve to be a documentation of the evolution of social media marketing in India. Rajesh set the stage for this Blog The Talk asking: It's a great time of the year to discuss where we stand on the conversational marketing front. Is it really making an impact on the ground, to the consumer and to the marketer? I'll toss the same question out to you. Is social media making an impact on the consumer? Do you find that it's changing behavior and influencing purchases and brand loyalty? For your reading pleasure .. PDFs of the article follow. Or if you prefer to Rajesh has the entire discussion of Blog The Talk posted. This is the second Blog The Talk that I've been honored to participate in. The first focused on the Social Media Challenges In India. Brilliant, Toby! I have been a fan of Dina's for ages. Is conversational marketing making an impact? Good question. It is certainly impacting circles of influence -- that is, those people who are passionate, interested and participative in their communities are benefiting from conversational marketing. It is facilitating and accelerating the flow of ideas and bringing them to the market more rapidly. But I have a feeling that 2008 may be the year when the influence networks flatten under the weight of a new world of participation. Gavin - interesting take. will you please expand a bit further on what you mean by "the influence networks flatten under the weight of a new world of participation?" I think that most brands strategy with social media simply seems to be a presence. And although it may keep the brand top of mind, I don't think it's doing too much to influence behaviour and brand perceptions. And it parallels with the election coverage. I love it. I think that one of the greatest implications of social media is that it offers consumers a forum to openly love or hate your brand. The thing is, this "forum" can possibly reach hundreds of millions of people across the globe. By the same token, consumer information about a product, business, or brand is now much more readily accessible. I definitely think that consumers are much more empowered than in days passed. @Ginny - Yes ma'am. With the multiple mediums of consumer generated content we can write about it .. video it .. or even sing about it on a podcast ;-) Not to mention passing our messages to our network via old fashion email! @Christian - I agree. Many brands are playing the "me too game" without any idea of how social media might actually influence behavior. Thanks for the examples.